With USB devices being so popular, it is becoming almost impossible to be able to plug all of them into your computer at the same time.. Ultra Products has came up with a little solution that will not only allow you to easily add USB devices to your computer easily, but it will also allow you to connect the Hub to a second computer so you can share the devices between the two computers. 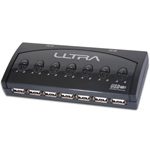 Today we are taking a look at Ultra Products 7 Port USB Buddy Hub. Similar to KVM switch but USB, neat. I could use one of those. Happy Modding to ya. - The USB ports might be a little close for some mail USB connectors. I think he meant male connectors and depending on how thick the housing around the male connector it could pose a problem trying to plug them in side by side. Happy Modding to ya. On some of the USB connectors (the male end of the connector that plugs in to the port), the outer rubber housing is a little thick (like in that picture). If you have a USB device that uses the large plug housing it might not fit in a slot that is next to another used USB slot. The two male plugs will hit each other because the ports are so close to each other.